→ Where are your stores? We only have one retail store. Located in Scotts Valley. There are online directions, maps, photos, and more on Contact Us page. If you’re in the area, please stop by and join us for a cup. → How long have you been in business? Surf City Coffee Company was founded in 1993 in Aptos, California. We began our business with our first retail store in Aptos. → Where does Surf City Coffee get their coffee beans? We purchase our coffees directly from a high-end coffee importer. During our formative years we outsourced our coffee offerings from well-established roasters. We felt we needed to better control our coffee quality, so we purchased our first Diedrich roaster and brought-in the best Roast Masters we could find. The rest is now history. We have the experience the equipment and the know-how to roast only the finest arabica coffees available. → Who owns Surf City Coffee Company, Inc.? We are proud to say that we are employee owned. The company was founded in 1993 out of Aptos, California. We have an outstanding team of professionals Surf City Coffee is dedicated to building customer loyalty and passion. We want your business for life! We only have one retail store located in Scotts Valley. There are online directions, maps, photos, and more on Contact Us page. If you’re in the area, please stop by and join us for a cup. Surf City Coffee Company was founded in 1993 in Aptos, California. We are proud to say that we are employee owned. The founders are Daniel and Suzanne McCourt. Mr. McCourt serves as the President and CEO. David Swanson joined the family in 2008 and is now a co-owner responsible for the retail business. Together with an outstanding team of professionals Surf City Coffee is dedicated to building customer loyalty and passion. We want your business for life! → How many employees are there? Approximately 40 between our retail store, warehouse/roasting facility, corporate, and website/online store. → What is your return policy? All Surf City Coffee Company Products are 100% Guaranteed! If any Surf City Coffee Company product fails to meet your expectations, we will replace it or refund the full cost of the product within 30 days of the purchase date. To return a product you purchased from our online store, contact us or call us at 888-773-3833. Go to our Policies page for more details. → How can I check on my order status? If you have created an account with us, you can check your order status by clicking “My Account” at the top of any page on our website: simply login with the email address and password you used when you created the account. If you elected not to create an account, you will still have received a confirmation of your order via email. Please keep this receipt for your records and reference. If you have any subsequent questions regarding your order, please contact us and refer to the order number on the confirmation email. → How can I verify that my online order went through? If you saw a confirmation screen after you clicked “Submit order” then your order went through. If you provided a valid email address, you should also receive an order confirmation via email. We can check on your order if you e-mail us with your last name and order number or order date, or you can log into your account by clicking the “My Account” link on any page. From there you can view your order history. → My order went through, but I made a mistake. How can I correct it? Please contact us immediately by telephone at 831-462-2305 and leave a message if necessary, or you can send us a message and include your last name, order number, and how you would like to change your order. → How can I find out exactly when to expect delivery of my Surf City order? We can track your order if you send us an e-mail and include your last name and order number. → How can I reduce shipping costs when ordering from Surf City online? Consolidate your orders and mitigate the handling fee. Many customers order 12oz or 5lb bags of coffee to offset shipping costs and to ensure that they don’t run out of coffee. If you are interested in reselling or purchasing larger quantities of our products, please contact us. We’d be happy to discuss alternative pricing and delivery. Please see our Policies page for more information on our shipping rates and policies. → How is Sales Tax calculated? Surf City Coffee Company collects applicable state and local sales tax for orders shipped to California or as required by law in the ship to state. The sales tax amount is estimated at the time you place your online order. The actual sales tax will be calculated and your order total adjusted accordingly when your order is processed by our backend order processing system. You will be notified of the exact amount charged to your account in the order confirmation. → Is it safe to use my credit card on SurfCityCoffee.com? We make every effort to ensure that your ordering information, including your credit card number, is protected while you are on our site. Our Web site uses SSL (Secure Socket Layer) encryption so that your personal information cannot be read as it passes over the Internet. You can tell you are using the Secure Socket Layer encryption when a gold or blue padlock appears in the corner of your Netscape or Microsoft browser. SSL keeps others from seeing your personal information by scrambling it so that only your Web browser, and the server of our Web site, can decipher it. In addition, your online password adds another layer of security to your guest profile. These measures make it very unlikely that your credit card information will be compromised online. However, in the event of an unauthorized use of your credit card, notify your credit card provider or issuing bank in accordance with its reporting rules and procedures. You are protected by regulations that cover credit card purchases and limit your liability to a maximum of $50 in charges. We do NOT store your credit card information for your security. If you prefer not to order online, please call us at 831-462-2305 to place your order. We are happy to help you over the phone. → Do you share my personal information? Surf City Coffee Company is committed to maintaining your privacy. We will absolutely NOT share your personal contact information with anyone without your expressed permission. 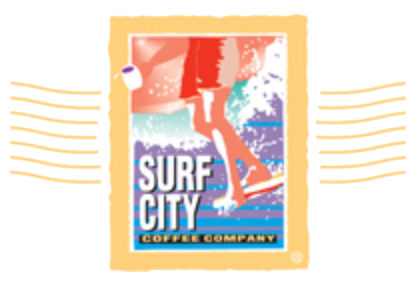 Surf City Coffee Company maintains customer data primarily for order processing and order reference purposes. Customers may request deletion of account information from our files by calling Customer Service at 831-462-2305. Please see our Policies page for more information. → What’s the advantage to creating an account? When you login with your username and password, it saves you time on the checkout process. Our system will automatically fill-in the check out form (except for payment information). We will occassionally send announcements and special offers to our registered customers. In the near future we plan to offer online order status and order history capabilities. These features will only be available to registered customers. → Do you offer wholesale pricing? Yes, Surf City Coffee Company does offer wholesale pricing to qualifying accounts. If you are interested in reselling our products, please contact coorperate office at: 831-462-2305 or wais@surfcitycoffee.com. → What’s the best way to store fresh coffee? Once roasted, coffee begins to lose its flavor as soon as it is exposed to air and moisture. We recommend buying your coffee at least every other week. Store it in an airtight container in a cool, dark place and grind it just before brewing. You can learn more about how to brew, taste, and store coffee in our Coffee College. → What is the best way to brew my Surf City Coffee? Please visit the Brewing Techniques section of our Coffee College. There you will find “5-Steps to Brewing the Perfect Cup” and much more. → Which type of grind should I use? We recommend you always purchase whole beans and store them whole until you’re ready to brew a pot. When it comes to grinding, it really depends on your brewing technique (auto-drip machine, French press, espresso, etc. ), the type of bean/roast, and your personal taste. There are lots of useful guidelines and recommendations in our More Tips section of the Coffee College. → How is coffee roasted? The whole process is described in detail in the Roasting section of the Coffee College. Coffee Life Cycle - coffee is harvested at different times of the year, depending on where it is grown. The red coffee berries are picked at exactly the right time. If the berry is under-ripe, the resulting brew lacks flavor; over-ripe berries produce a better cup. A single coffee tree produces about 1 pound of coffee. If you also consider that a coffee tree may take at least 3 years from planting to becoming viable, you can understand the huge investment on behalf of the grower. Add in all the other factors, such as weather & politics, and it’s understandable why these Arabica beans are more expensive, and thus a consumer pays a higher price at the counter. Following the harvest, the coffee berries, known as “cherries”, are processed by either the wet or dry method. In the wet method, sometimes known as European preparation, the cherries are soaked in water to soften the outer skin, or husk. The cherries are then pulped to remove the skin, and the green berries are washed, fermented, dried, and graded. In the dry method, the coffee cherries are spread and dried by the sun over a two or three week period. When dry, the husk is removed and the beans graded. In the wet/dry method, the coffee cherries are picked, and then dry fermented. The husks are then removed after soaking in hot water. Green beans are carefully sorted to weed out defective beans. The coffee is packed after grading in bags weighing between 132-156 pounds, and exported to the importer, then on to the Roaster. 1. Start with freshly roasted whole bean coffee and grind it as you use it. Basic non-commercial coffee grinders are affordable. 2. Use good water. Coffee is 98-99% water. Need we say more! Do not use distilled water due to the absence of minerals, which actually help the coffee taste better. 3. Measure your coffee. 2 Tablespoons of coffee to every 8 oz. cup of water. 4. Brew coffee by an Auto-Drip coffee maker or French Press. If possible, do not use a machine with a burner, unless you are diligent about turning off when coffee has completed it’s brew cycle. The fresh brewed coffee will burn and the great flavors, body, & aroma will be lost! A gold filter versus paper filters will give you a great flavor and minimize any paper taste. 5. ENJOY your fresh cup of coffee! Relax and enjoy your perfectly brewed coffee!! Acidity - Taste those high, thin notes, the dryness the coffee leaves at the back of your palate and under the edges of your tongue. This pleasant tartness, snap, or twist is what coffee people call acidity. It should be distinguished from sour, which in coffee terminology means an unpleasant sharpness. The acidy notes should be very clear and bright in the Mexican, a little softer and richer in the Sumatran, and overwhelming in the Yemen Mocha. Aged coffees, and some old crop, low-grown coffees, have little acidity and taste almost sweet. Many retailers avoid describing a coffee as acidy for fear consumers will confuse a positive acidy brightness with an unpleasant sourness. Instead you will find a variety of creative euphemisms: bright, dry, sharp, vibrant, etc. An acidy coffee is somewhat analogous to a dry wine. In some coffees the acidy taste actually becomes distinctively winey; the winey aftertaste should be very clear in the Yemen Mocha. Arabica - “Coffee Arabica” is the species name assigned to the coffee tree by European botanist Linnaeus while categorizing the flora of the Arabian peninsula. Arabica are the bean of choice in “gourmet” or “specialty coffees”. Arabica coffee produces the rich flavor and body found in a good cup of coffee. Robusta beans lack this flavor and body. For more information on Aribica vs. Robusta beans, see Bean Basics. Aroma - The sensation of the gases released from brewed coffee, ranging from fruity to herby, as they are inhaled through the nose. Strictly speaking, aroma can’t be separated from acidity and flavor. Acidy coffees smell acidy, and richly flavored coffees smell richly flavored. Nevertheless, certain high, fleeting notes are reflected most clearly in the nose of a coffee, as some tasters say. There is frequently a subtle floral note to some coffee that is experienced most clearly in the aroma, particularly at the moment the crust is broken in the traditional tasting ritual. The best Colombian and Kona coffees are particularly noted for their floral aroma. Aromatic - Designates a coffee that fully manifests the aroma characteristic of its nature and origin. Balanced - This is a difficult term. When tasting coffees for defects, professional tasters use the term to describe a coffee that does not localize at any one point on the palate; in other words, it is not imbalanced in the direction of some one (often undesirable) taste characteristic. As a term of general evaluation, balance appears to mean that no one quality overwhelms all others, but there is enough complexity in the coffee to arouse interest. A well-balanced coffee contains all the basic characteristics to the right extent. Bitter - A basic taste characterized by solution of quinine, caffeine, and certain other alkaloids. Perceived primarily at the back of the tongue. Canephora are more bitter than arabica coffees. A desirable characteristic at a certain level. Body - The physical properties of the beverage resulting in the tactile sensations perceived in the mouth during and after ingestion. Used to describe the mouthfeel of a drink, corresponding to a certain consistency. Body or mouth feel is the sense of heaviness, richness, and thickness at the back of the tongue when you swish the coffee around your mouth. The coffee is not actually heavy; it just tastes that way. The Mexican coffee should have the lightest body and the Sumatran the heaviest, with the Yemen Mocha somewhere in the middle. If you can’t distinguish body, try pouring milk into each coffee. Note how the flavor of the heavy-bodied Sumatran carries through the milk, whereas the flavor of the Mexican dies away. If you drink coffee with milk, you should buy a heavy-bodied coffee. If you drink black coffee, you may prefer a lighter-bodied variety. Banquet - The total aromatic profile created by the sensations of gases and vapors on the olfactory membranes as a result of the volatile organic compounds present in the fragrance, aroma, nose, and aftertaste of coffee. Caramel - An aromatic sensation created by a moderately volatile set of sugar carbonyl compounds found in coffee’s nose that produce sensations reminiscent of either candy or syrup. Chocolaty - An aromatic sensation created by a moderately volatile set of pyrazine compounds found in coffee’s aftertaste that produce sensations reminiscent of unsweetened chocolate of vanilla. Complexity - Complexity describes flavor that shifts among pleasurable possibilities; a harmonious multiplicity of sensation. The Yemen Mocha definitely should be complex; if the Sumatran is a good one it should also be complex; the Mexican is undoubtedly the least complex coffee of the three. Creamy - Moderately high level of oily material suspended in the coffee beverage. The result of pronounced amounts of fats present in the beans. Dark Buy Dark Roasted Coffee - Roasting term meaning dark brown beans with a shiny surface; equivalent to espresso or French roast. Delicate - A secondary coffee taste sensation characterized by fragile sweet-subtle sensation just past the tip of the tongue. Caused by the lowest possible combination of sugars and salts that still produce a sweet cast to the taste, a combination easily broken up by other taste sensations. Typified by a washed New Guinea arabica coffee. Earthy - An odor taint in the coffee beans that produces an mineral-like taste sensation. Results when fats in the coffee beans absorb organic materials from the ground in the drying process during harvesting. Flavor - Flavor is the most ambiguous term of all. Acidity has something to do with flavor, and so do body and aroma. Some coffees simply have a fuller, richer flavor than others, whereas other coffees have an acidy tang, for instance, that tends to dominate everything else. Floral - An aromatic sensation created by a highly volatile set of aldehydes and esters that produce sweet fragrance sensations reminiscent of a flower. Fruity - An aromatic sensation created by a highly volatile set of aldehydes and esters found in coffee’s aroma. Either a sweet sensation reminiscent of citrus fruit or a dry sensation reminiscent of berry fruit. Full - An intensity description of bouquet indicating gases and vapors are present at a moderately pronounced strength. Grady - A background flavor of dirtiness but not qualifying as dirty. Mostly used in the United States. Heavy - A moderately high level of solid material suspended in the coffee beverage. Result of fine particles of bean fiber and insoluble proteins present in pronounced amounts. Intense - A strong aromatic quality of the gases and vapors present in the bouquet of the coffee. Italian Roast - Term applied to coffee that has been roasted darker than French Roast. Much used by Italians, as well as in many of the coffee producing countries. Does NOT mean the bean came from Italy. Light - A moderately low level of solid material suspended in the coffee beverage. Result of fine particles of bean fiber and insoluble proteins present in perceptible amounts. Lemon Peel - A mild hint of lemon in the aromatic qualities. Medium Roast - Coffee beans roasted to the American norm. Mellow - A primary coffee taste sensation created as salts in the coffee combine with sugars to increase the overall sweetness. Characteristic found most often in washed arabica coffees grown at elevations below 4,000 feet, such Kona coffee from Hawaii. Mellow ranges from mild to delicate. Milk Chocolate - See “chocolaty”. Mild - A secondary coffee taste sensation characterized by a predominantly sweet tingle just past the tip of the tongue. Caused by high concentrations of both sugars and salts. Typified by a washed Sumatran coffee. Neutral - A secondary coffee taste characterized by the absence of a predominant taste sensation on any part of the tongue but causing a distinct parching sensation on the sides of the tongue. Caused by a concentration of salts high enough to neutralize both acids and sugars but not enough to provoke a salty sensation. Nippy - A secondary coffee taste characterized by a predominantly sweet, nipping sensation at the tip of the tongue. Caused by a higher-than-normal percentage of acids being sour. Nutty - An aromatic sensation created by a moderately volatile set of aldehydes and ketones that produce sensations reminiscent of roasted nuts. Characteristic of poor quality beans, that float, remain lighter in color and have a peanut flavor. Piquant - A secondary coffee taste sensation characterized by a predominantly sweet, prickling sensation at the tip of the tongue. Caused by a higher-than-normal percentage of acids actually sweet to the taste instead of sour. Typified by a Kenya AA coffee. Point - A coffee with good positive characteristics of flavor, body and acidity. Pungent - Applies essentially to a full-bodied and slightly aggressive coffee. Rich - Intensity description indicating gases and vapors are present at highly pronounced strengths. Richness - Richness partly refers to body, partly to flavor; at times even to acidity. The term describes an interesting, satisfying fullness. Robusta - High in caffeine and rather bitter. Generally less acid and less aromatic than arabica coffee. Often slightly woody. Round - A balanced coffee whose basic organoleptic characteristics are just at the right level, with none particularly apparent, giving the impression of roundness. Sharp - A primary coffee taste sensation created as acids in the coffee combine with salts to increase the overall saltiness. Characteristic found most often in unwashed robusta coffee. Sharp coffee ranges from rough to astringent. Smooth - A primary coffee taste sensation created as acids in the coffee combine with salts to increase the overall saltiness. Characteristic found most often in unwashed robusta coffee. Sharp coffee ranges from rough to astringent. Soft - A primary coffee taste sensation created as acids in the coffee combine with salts to increase the overall saltiness. Characteristic found most often in unwashed robusta coffee. Sharp coffee ranges from rough to astringent. Soft-Sweet - A pleasant clean taste. Denotes a smooth cup free of any foreign flavors. Spicy - An aromatic sensation created by a slightly volatile set of hydrocarbon compounds in coffee’s aftertaste that produces sensations reminiscent of either wood-spice (cinnamon) or wood-seed (Clove). Strong - Coffee giving a pungent impression in the cup, rich in flavor. Developed by roasting or having a consistent mouthfeel. Sweet - A basic taste characterized by solutions of sugars (sucrose and glucose), alcohols, glycols, and some amino acids, perceived primarily by the tip of the tongue. A trade term to describe coffee free from harshness of Rio flavor or any form of damage. Swiss Water Decaf® - The SWISS WATER Process is a 100% chemical free, patented process used by premium roasters and demanded by discerning consumers around the world. Chemicals are used to decaffeinate most coffee. But the SWISS WATER® Process uses only water. It’s a patented process that results in great tasting coffee that is never subjected to chemicals. Tangy - A secondary coffee taste sensation characterized by a predominantly darting, sour sensation along the sides of the tongue. Caused by a high-than-normal percentage of sugars, giving the taste almost a fruity sensation. Thick - A relatively high level of solid material suspended in the coffee beverage. A result of fine particles of bean fiber and insoluble proteins present in substantial amounts. Most often characteristic of espresso-style coffee. Thin - A relatively low level of solid material suspended in the coffee beverage. A result of fine particles of bean fiber and insoluble proteins present in imperceptible amounts. Lacks body or substance and is insufficiently concentrated and roasted. Winey - A primary coffee taste sensation created as the sugars in the coffee combine with the acids to reduce the overall sourness. Characteristic found most often in unwashed arabica coffees grown at elevations above 4,000 feet. Winey coffees range from tangy to tart. Special and agreeable flavor acquired by certain mocha-type, freshly milled, or first crop coffees. Wake Up Coffees - Looking for that kick to get you started each day? Here you will find our get a kick blend coffees with the highest caffeine content, sure to brighten your day or night! Organic Coffees - CCOF Certification Services is accredited by the U.S. Department of Agriculture (USDA) under the National Organic Program (NOP) standards. CCOF Certification Services is widely known for its highly-trained staff, expertise in interpreting and upholding organic regulations, strong customer service and support and, above all, for a commitment to organic integrity. As a result, the CCOF seal is one of the most recognized and trusted in the industry. Dessert Coffees - Coffee to enjoy after dinner or when you want the flavor of a great coffee without the caffeine.